This page provides you with Chief Information Officer resume samples that you can use for inspiration in writing your own resume, or for creating one through our easy-to-use resume builder. Below you'll find our how-to section that will guide you through each section of a Chief information officer resume. As a Chief information Officers, you have been responsible for the company’s information technology (IT) strategy and the computer systems required to support the organization's unique objectives and goals. This role has been evolving over the years, as more organizations become digital, and that eventually lead to this being one of the most fierce and competitive industries in the market. If you are looking for the next challenge in your career and haven’t found the perfect Chief Information Officer resume sample yet, don’t worry, you have come to the right place. We will be inspiring you in a way that recruiters will appreciate and want to see. Resumes are the window into you as a person and a professional. Anyone looking to apply for the role of a CIO must take the time to construct their resume in a professional manner. The resume you send to recruiters will say so much about you and it’s vital to have a unique resume that will stand out amongst hundreds. Don’t worry, we have lots of experience in helping thousands like you with the best CIO resume sample in the market. Let us inspire you and get ready to succeed! 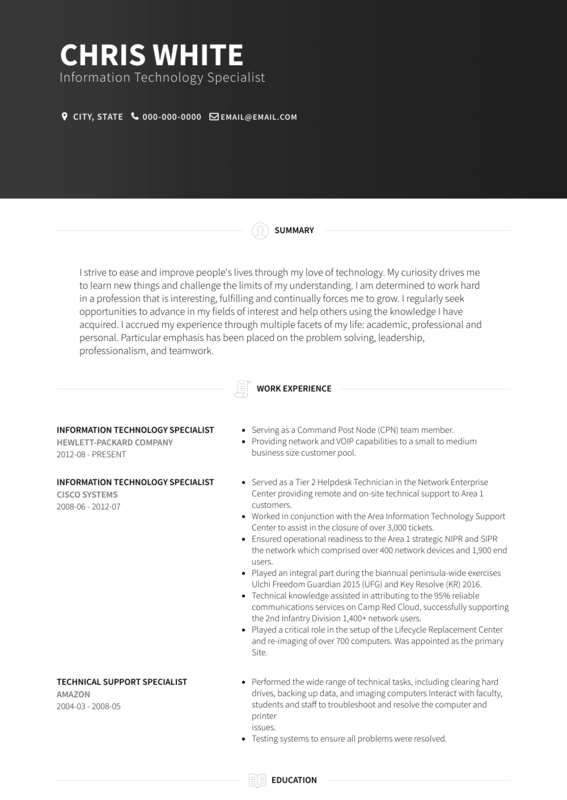 How to Write a Chief Information Officer Resume? As a CIO you have multiple qualities: you’re a leader, you have lead teams and you are able to understand how a company works and operates, having a clear idea of the big picture. You have probably collaborated with management to improve data integrity and elimination of redundancies, driving projects from feasibility analysis to delivery. Yours is a crucial role in any business! We want to make sure you highlight your skills and that your resume broadcasts this message loud and clear! Use big headings too, matching them with clean white space. And now, listen: Grammar check please! Recruiters would never give a company to someone who doesn’t care or does not pay attention to details. Summarize the types of jobs you’ve had which relate to CIO. Avoid words like, ‘when I’m CIO’, it looks pretentious. What should be added? Well, your recent work history for a start. What positions have you worked at recently and what sort of experience did that provide you? These things must be added simply because it’s showing a recruiter why they should pick you. What is more, the history of your employment could allow a recruiter to say for certainty you’ve got the experience to work as a CIO in their organization. Tell them what qualifies you as a CIO. If you need more tips on writing the best work experience section for a great Chief Information Officer like you, check out our detailed resume guide. Use the table below to add skills important for CIO. If an excellent CIO Resume sample is not enough, why don’t you check out one of the most efficient Chief Information Officer resume templates here : many professionals like you have successfully used it to take their career to the next level.